I enjoyed redoing the votive candle holders for my daughter so much, that I got inspired by the teal color. So I just couldn't stop there. I found a jewelry box at Goodwill (I really love that place!) for $5.00. It was in relatively good condition but was just an ordinary brown wood with dull gold metal pulls. 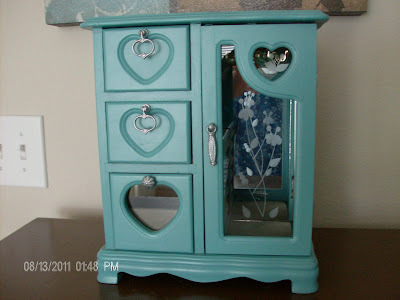 Since I still had some of the patio paint that I had mixed to get that beautiful teal color, I couldn't resist the challenge of repainting the jewelry box to match the votive holders. The first thing I did was to remove the hinges, glass panels, and doors so I could sand and prime the interior and exterior surfaces. There was also a mirror inside that I taped and covered with paper to protect it from any stray paint. After priming I painted the wood surfaces teal and the hinges, pulls, and screws silver. While I was cleaning the two glass panels before reinstalling them, I accidentally broke the side glass panel. I cried tears of frustration snce I didn't have another glass panel to replace it. However, my tears were short-lived as I came up with a solution. 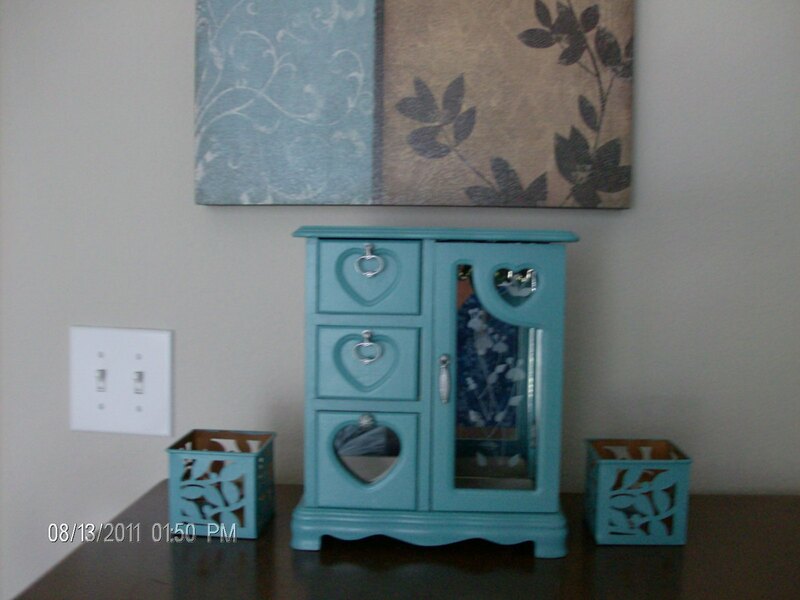 As a temporary replacement, I simply cut a piece of heavy carboard to size and painted it the same teal color. Meanwhile, I'm still looking for another panel of glass. In my enthusiasm, I forgot to take a before picture, but here is the finished product. My daughter absolutely loved it and has no idea (at least she had no idea before I posted this) that there was ever a side glass panel there. This Is So Beautiful!!! I Love It !! !